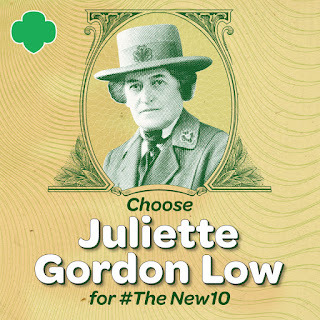 Calling all Girl Scouts: The $10 bill is getting a makeover and we need you to help us convince the U.S. Department of the Treasury to choose Girl Scouts’ founder Juliette Gordon Low to appear on the new $10 bill. Last month Treasury Secretary Jack Lew announced that a woman of historical significance would replace Alexander Hamilton on the new $10 bill. The redesigned $10 note is scheduled to roll out in 2020, the 100th anniversary of the passage of the 19th amendment, which granted women the right to vote. There are hundreds of trailblazing women throughout American history who would make great choices to replace Hamilton. 2. The Girl Scout Movement’s proud tradition of inclusion has left its mark on American history. From our earliest years—we were founded in 1912—girls of all colors were welcomed at Girl Scouts. The first African American Girl Scout troops formed in our first decade. Hispanic and American Indian troops joined them in the 1920s. Girl Scout troops desegregated before many other institutions in American society, building bridges between girls of different colors. 3. Juliette Gordon Low didn’t believe in stereotypes. She believed in shattering them. Against the conventions of her time, Juliette Gordon Low traveled the world alone, visiting India and Egypt. She moved to Paris to study art, and tackled every challenge that came her way with both tenacity and grace, serving as a role model for thousands of girls. She encouraged them to study revolutionary topics like aviation, electrical systems, and other technical topics. 4. Juliette Gordon Low believed all girls matter. Juliette Gordon Low, who was nearly deaf for much of her life, made sure early Girl Scout troops welcomed girls of all faiths, girls with disabilities, and girls from across the social and economic spectrum. She envisioned a world where a girl who came from an orphanage in Savannah could belong to the same sisterhood as a girl from one of the city’s most prominent families. Just as Gordon Low intended, the Girl Scout Movement remains open to all girls today. 5. Millions of girls and women have made our country—and the world—a better place through Girl Scouts. Service has been at the heart of the Girl Scout Movement from the beginning. Today, 103 years later, Girl Scouts still make the world a better place every day. Our alumnae even report higher levels of civic engagement. The service of millions of girls of courage, confidence, and character has impacted generations, transforming countless communities. Help make history! Share your support for putting Juliette Gordon Low on the new $10 bill on Facebook, Twitter and Instagram using #TheNew10 today. Get involved with Girl Scouts. Join, volunteer, or donate today.